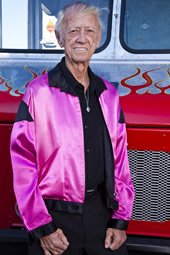 On June 14, 2014, at age 75, rockabilly legend Joe Clay performed before the largest crowd of his 63-year music career. The concert in Great Britain drew thousands of fans and confirmed the decision Clay made years earlier to serve as his own business manager and take control of his career. Not only is Clay experiencing greater success today, but he’s having much more fun performing. Joe Clay is the stage name Harvey-Louisiana-native Claiborne Cheramie gave himself in the 1950s. Having started playing professionally at age 12, by the time he was 18, Clay had cut several successful records, signed a recording contract with RCA and even performed on the Ed Sullivan Show. But back then, Clay only focused on performing, leaving business and booking decisions to his manager. Over the decades since then, he has learned that while placing trust in others is indeed important and often necessary, it is equally important to be personally involved in the business side of your career. Since no one other than you has your priorities and goals at the very top of their list, it is imperative to take an active role in charting your own future. With well over a half century in the business of live music and performance, Joe Clay has mastered so many of the details of this part of the entertainment industry that decisions come almost as second nature now. While his business acumen propels him to bigger and bolder performances, he continues to shape and hone his on-stage skill and his ability to read and connect with his audiences. And this original rockabilly pioneer – this legend – is loving every minute of it. Whether behind the scenes or facing fans by the tens of thousands, Joe Clay exudes an energy and understanding that can be defined in three words: excellence through experience. Joe Clay … Peoples Health Champion.